How do you want to learn? By guessing or engaging? Last night, I logged into my Red Cross First Aid, CPR, AED course, started the AED section and immediately found myself wanting to yell “clear” and deliver a few joules to the course itself. After reviewing a short (under 1 minute) video on what AED stands for, I clicked next and entered my first quiz. Yes…I understand the value of presenting challenges to the learner. I get it when we use pretests to help branch the learner to relevant information. So, I started the quiz. I did HORRIBLY. But, no worries, I figured I would be put back into the presentation of information and given a series of activities to help me build knowledge. WRONG! My only option was to retake the quiz, read the feedback and move on. Or, I could just skip all that and move on anyway. Thinking about this experience, I was reminded of the distinction between guessing and failure. In the Red Cross course, I guessed my way through the quiz. The thing that was missing was recognition that my guesses would lead to knowledge building. Guessing can be a powerful learning tool because we can learn through corrective course action (thinking). Not being presented with additional options though left me feeling like I had simply been unfairly evaluated. Although I am certainly no expert (although I am excited to start a course on Gamification tonight), this is one area where Gamification of learning is a much better system. Imagine the Red Cross course as a game. Certainly life saving is no game itself. But, learning to perform life saving skills should be an engaging experience. This is certainly a “what if” post meant to get us all thinking. 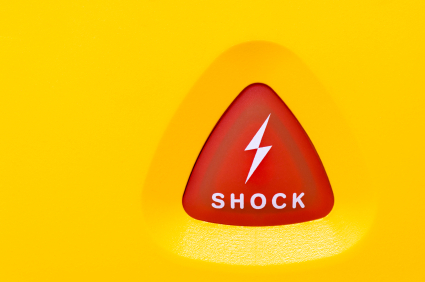 So, what if the AED section included a task where I was faced with a victim? Each time I helped the victim, I was then presented with more and more challenges. For example, one question in the quiz asked if an AED could be used in the rain or snow. That could be a Level 2 scenario, presented after I had helped someone in rather perfect conditions. I had no idea how to answer that question, so I said NO. During the quiz, I was told…”That is incorrect.” That was followed with some explanation. But, certainly, I could have been engaged in the decision making to a higher degree through game elements presented in a increasingly challenging fashion. The game could have shown the consequences of my attempt to move the person to a dry area. Maybe the result would have been a failure to save them due to lack of action as critical response time eroded. That would be awful of course, but a game could clearly show how my decisions impact results and ultimately, real lives. As the course is now, my guessing did little to engage me and help me build knowledge and skills. We could all point to many circumstances with Guessification is used as a way to teach. Instead, thinking and Gamification could be so much more effective. So, let’s get out there and eliminate guessifaction and turn failure into learning experiences. This requires a huge shift in the way subject matter experts think. After all, they went to school – so they know all there is to know about training. Simply spit out some content, tack on a quiz, and voila – you have training. In the situation of a CPR course, your SME could make a strong case for ILT – featuring those resuscitation dolls – and she’d probably be right. But the type of game you suggest could provide a great foundation and even allow for scenarios that could not be re-created in the classroom – unless it happened to be raining or snowing in the class where the training occurs. Couldn’t agree more Chuck. We fall back on what we know…probably the most dangerous human trait in regards to education and learning.